SOUTH PLAINFIELD, N.J. (CNS) — Clergy, religious and the faithful of the Diocese of Metuchen welcomed its new shepherd, Bishop James F. Checchio, with song and prayer during a Mass marking his episcopal ordination and installation at the Church of the Sacred Heart. 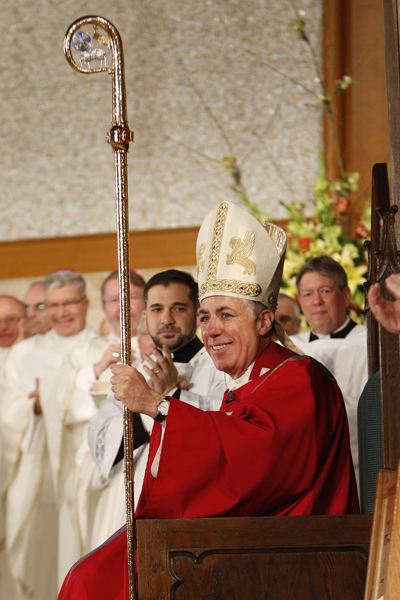 “As the new shepherd of this beautiful diocese, I look forward to getting to know you better in the coming days and to deepen our friendship with Christ through our prayer and concern for his church,” Bishop Checchio said. The native of Camden, New Jersey, who celebrated his 50th birthday April 21, told the congregation he was happy to return to his home state. “I feel blessed to be here in the Diocese of Metuchen,” he said. The bishop also reflected on one of his favorite themes: God’s mercy. “Just this past weekend in St. Peter’s Square, Pope Francis — very conveniently for me — spoke on these words, which are the same as my episcopal motto and come from St. Paul: Be reconciled to God,” Bishop Checchio said. “The Holy Father said these words are an invitation to all Christians, especially in this Jubilee Year of Mercy. God offers us his forgiveness and our sins can never keep us from his mercy as long as he finds in that person, the Holy Father said, some sign of contrition for the evil. “This holy Year of Mercy is a time for each of us to accept his offer of reconciliation and to bring it to the world. Before being appointed as Metuchen’s new bishop by Pope Francis March 8, Bishop Checchio served as rector of the Pontifical North American College in Rome for 10 years after being vice rector for more than two years. Bishop Checchio noted that his experience at the college deepened his love for the priesthood and the church. He also spoke about the importance of vocations to consecrated life. “I love being a priest,” said Bishop Checchio, who was ordained for the Diocese of Camden in 1992. “I am so grateful to God for his gift of love in calling me to follow him in his holy priesthood. I am likewise grateful to God for the grace he has given me over these years of my priestly ministry. “I certainly pray that many more young men in our diocese will respond to that call and we need to make every effort to ensure that our young people can hear the call of God and know what a blessed life it is, whether it is the priesthood or religious life,” he said. 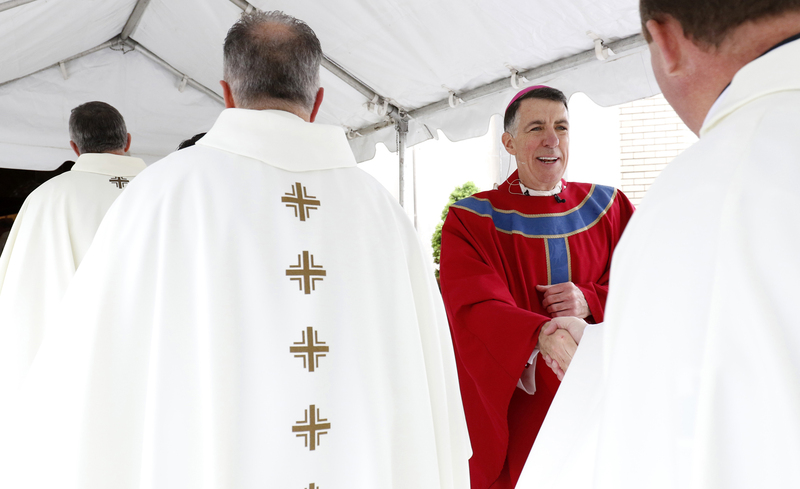 The new bishop also thanked Bishop Bootkoski, who served the Metuchen Diocese for 14 years before reaching the mandatory retirement age of 75, and the diocese’s founding bishop, Cardinal Theodore E. McCarrick, who also attended, for their love and hard work on behalf of the faithful. Archbishop John J. Myers of the Newark, New Jersey, served as consecrating bishop. Bishop Checchio’s predecessor, Bishop Paul G. Bootkoski, and Bishop Dennis J. Sullivan of Camden were co-consecrators. Archbishop Bernard A. Hebda of St. Paul and Minneapolis gave the homily. Archbishop Hebda reflected on the providence of the Bishop Checchio’s ordination and installation on the feast of two of the church’s earliest shepherds, St. Philip and St. James. “While pilgrims traveling to Rome so often associate the Eternal City with Peter and Paul, the princes of the apostles, the apostles Philip and James are actually buried in Rome in the Church of the Twelve Apostles, a stone’s throw from the Casa Santa Maria where the young Father Checchio lived as a student, pursuing his doctorate in canon law,” Archbishop Hebda said. “My suspicion is that from this day forward, this newest successor of the apostle is going to experience a profound link with Philip and James. They certainly would serve as inspiring role models and already share some similarities with our new bishop,” he said. The Diocese of Metuchen, which was erected in 1981 by the partitioning of the Diocese of Trenton, serves 650,000 Catholics in 90 parishes. Donahue is associate editor of The Catholic Spirit, newspaper of the Diocese of Metuchen.